Getting your child to become creative and express their creativity isn’t as expensive as parents might seem to think. One way that children can express their creative side and get inspired is by designing with clay. This is also known as pottery making and can be done using pottery wheels. By doing this children are learning different ways and different things that they can create with clay. Many adults think that pottery making is just simply for adults but pottery making is in fact extremely beneficial to your child. Due to this there are some pottery wheels specifically only for children. Your child will love getting dirty and seeing their finished product displayed around the house! For this update we added two new sections of things you should know: “How Pottery Making Works” and “Things that you can make” to our criteria section. We also made sure that each product on our list is still currently available in today’s market. 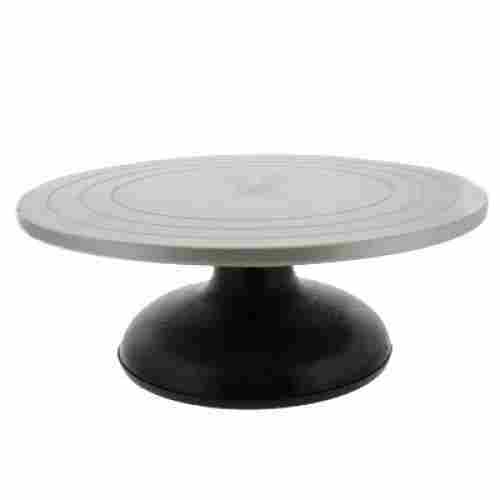 The Mindware pottery wheel was designed with beginner sculptors in mind. 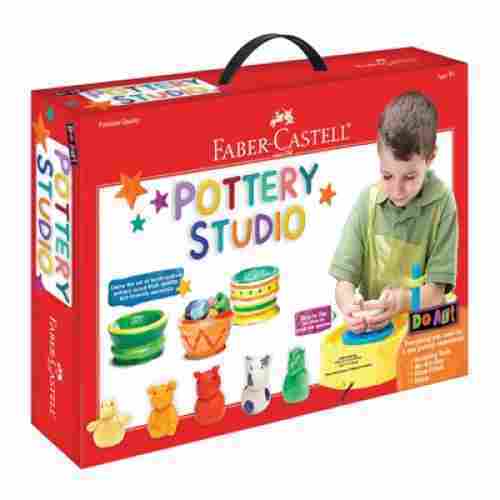 Equipped with a foot pedal and a dual-directional pottery wheel, your child can learn the basics of creating pottery. With two pounds of air-dry clay, instructions, paintbrushes and 12 paints, your child has everything they need to begin crafting. The set also includes an additional five pounds of clay to keep the fun going. The wheel is highly durable and designed to withstand countless craft sessions. Children 7 years old and up can easily center their pieces on the wheel and construct pieces straight from their imaginations. The built-in safety stop is not only designed to protect the integrity of the motor from overheating, it is also meant to help kids develop a light touch with the clay--this enables them to improve their creative skills more and a kinesthetic sense for what the proper feel of a finished product is like. The fact that this wheel comes with an AC adapter can be seen as one of the greater benefits. A continual power source is more economical and it can be what differentiates a serious piece of equipment from simply another toy. The variety of 12 paints that can be mixed and matched is also an added bonus when it comes to the number of projects that you can encourage your child to embark on. 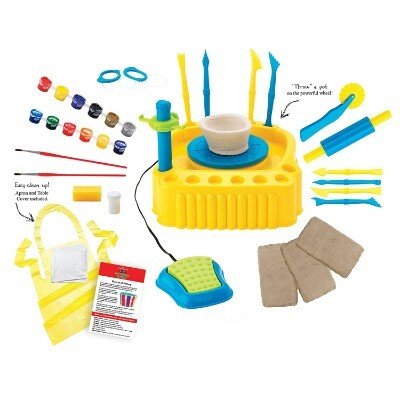 Your child is super-safe to craft as this kit includes synthetic clay that will not contain microbes. The instruction manual makes this a great set for beginners as it will teach your child the basics. If your little one is looking to dabble in the world of sculpting, the pottery studio for kids is a perfect place to start. 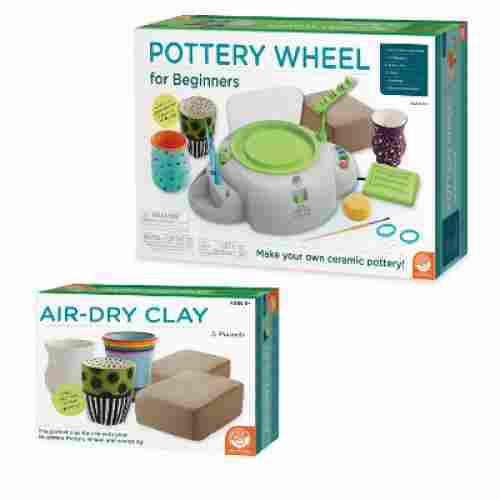 The kit includes easy to understand instructions that will teach your child the history of pottery as well as basic techniques. Once they have the techniques down, they can use the three pounds of clay, crafting tools, and pottery wheel to sculpt their own pieces. Keep your child’s clothes clean while they craft by using the included apron. 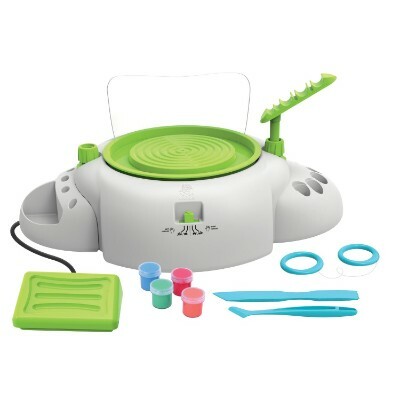 The battery-powered wheel makes this set easy to use by children as young as 8. The synthetic clay makes this a better option for kids since it doesn’t carry the same microbes and microorganisms that regular clay does! The instruction manual also doubles as a sketch in the history of pottery and art! This gives an almost semi-professional pottery experience to your child! The foot pedal operation inculcates the same kind of manual dexterity and hand-eye coordination required of a professional potter that also throws clay on the wheel! It doesn’t just end with that! It’s unique and a great starter kit for young earthenware artisans. The personalization of the earthenware projects is superb. The variety of sculpting tools gives your child the opportunity to construct their own creations. Whether they create an original piece or create one of the six suggested projects, they can use the five metallic-colored paints to decorate their piece. Children 6 and over will have a blast crafting pieces they can cherish for years to come. 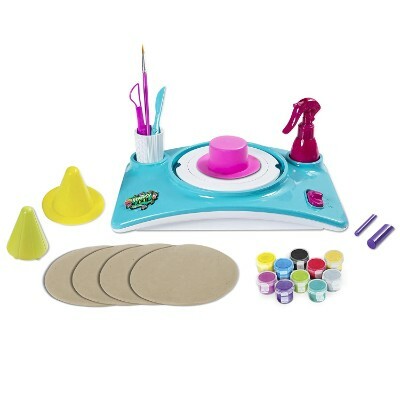 This kit will stimulate your child’s imagination and unleash their creativity as they use the provided tools to create and customize their original pieces. 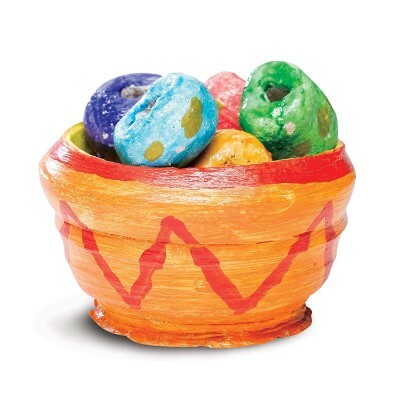 Your child will increase their fine-motor skills as they use the clay to sculpt. The fun doesn’t have to end when your child runs out of clay because additional clay can be purchased separately. Like the Do Art Studio, the Cra-Z-Art comes with a foot pedal mechanism that also runs on batteries. Since the foot pedal is conveniently located away from the main wheel, it reduces the risk of electrical issues. The base of the wheel also comes with slots for placing the different sculpting tools of the set. The only thing missing is an instructional guide upon which kids can initiate their earthenware creation adventures. 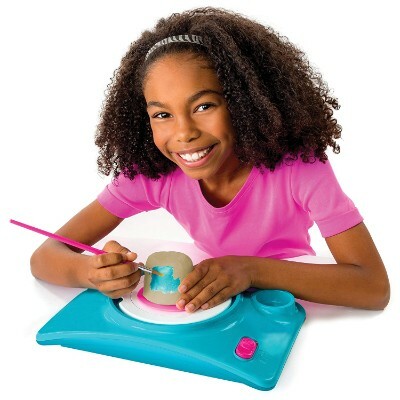 It may not be a Faber Castell or a Spin Master but it does provide for everything that kiddos need to sculpt and decorate fabulous earthenware creations. The kit already comes complete with colored clay, a sculpting tool, and 6 small canisters of paint. 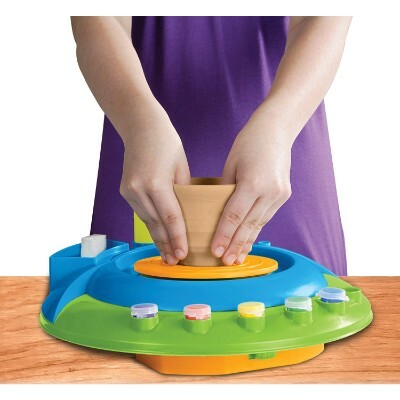 This a colorful and handy little pottery wheel set! All of the tools are conveniently set within the tray next to the plate, which allows for an easy reach while turning the clay pot! 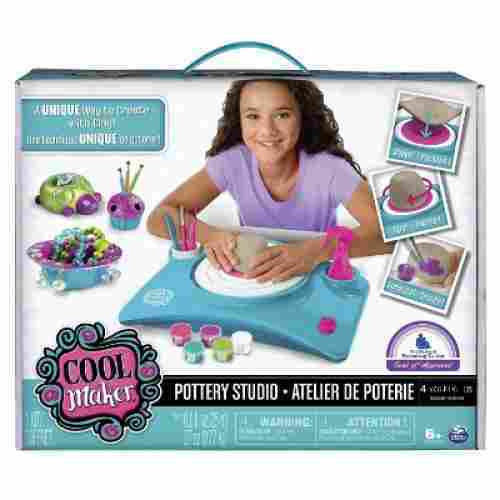 This is another design with a battery operated foot pedal instead of the on/off switch, which will make your child proficient in pottery design as well as strengthening their manual dexterity. The acryllic paints are also placed right on the other side of the plate across from the tools. This wheel can be used with any clay, but the colored option that’s included makes it super cool when it comes to being creative! 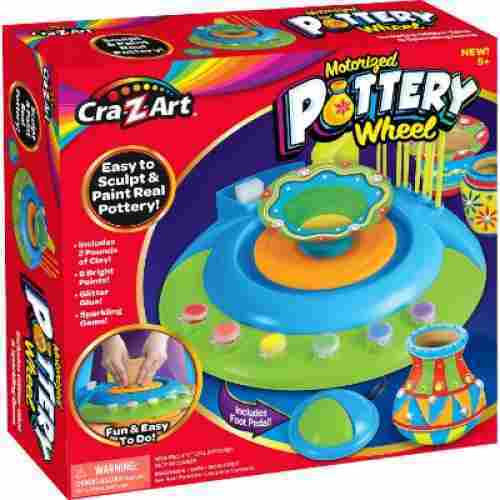 The Cra-Z-Art may not be the best pottery wheel for kids but it sure can stimulate children’s imagination and creativity by letting them explore what can be done with a rotating disk with all the finishing materials beautifully positioned on its round base. Your child can use this wheel for a variety of projects. The heavy-duty material gives them the reassurance that their project will be safe and stable while resting on the base until it is finished. 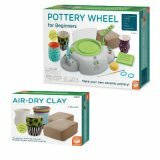 If your child has experience in working with ceramics the US Art supply pottery wheel is perfect for them. Whether they are painting or sculpting a cake, the heavy-duty base will keep their project in place. Both the base and top are composed of a heavy cast metal which not only provides stability but also gives this wheel a high level of durability. Your child can even create larger projects as it is designed to hold up to 50 pounds. 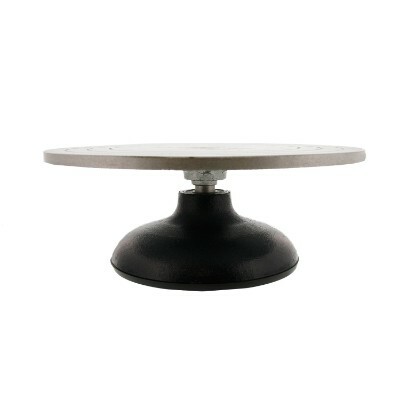 The ball bearing allows the wheel to spin easily and smoothly. While it is made of heavy cast metal, the wheel is only 10 pounds, thus making it easy for you to transport. The base of the wheel is equipped with a non-skid rubber boot that will not only keep the wheel from sliding but will also prevent it from scratching any surface. The concentric circles on top of the wheel make it easier for your child to center their work. If your child plans to use the wheel to sculpt, they will appreciate the extra momentum they gain while spinning due to the rim being weighted. 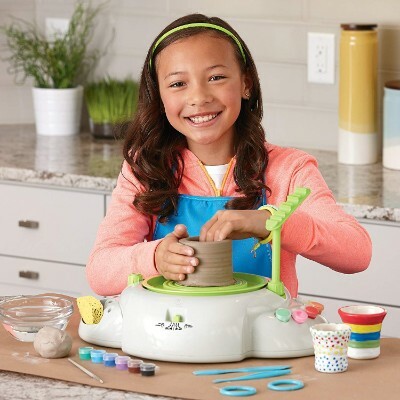 While we do recognize that these gadgets are essentially for children which simply means they don’t really need to be like the real thing, we still endeavored to include only those items that can provide the once-in-a-lifetime experience of making pots by hand. We wanted children to be inspired by these toys. Since kids will be physically handling a variety of clay or dough-like materials, it was crucial that we ascertain the safety of these substances or materials. We don’t want your children to be squishing and molding these gooey substances only to regret later on if you find out that the substances are actually harmful to your kid’s health. Safety is a paramount concern in all of the things we choose for our kids. This is also true for its wheel-operating mechanism. Pottery making can be extremely educational and beneficial to your child. Every parent wants to give their child something that will ultimately help them in the long wrong. When having your child make pottery inspire creativity not just because your child is using their imagination but because they can also develop their cognitive skills. This is a wonderful way for your child to enhance their creativity, hand-eye coordination and various other skills as well. It also will help strengthen your child’s muscles.It is a wonderful outlet for your child to get inspired and use their imagination. Playing with clay and creating their own objects will help raise your child's self-esteem. How pottery making can raise your child's self-esteem is simple due to the fact that once your child finishes creating something, they will feel accomplished over the work they just created. For a beginner trying to figure out how to use a pottery wheel might seem a bit overwhelming and challenging. Some helpful tips is to make sure that you start up the wheel before getting your clay ready. By doing this this gets all air bubbles out which is essential to whatever piece you’re making because it will prevent cracks in your pieces later on. When preparing your clay know that there are two different ways that you can prepare. The first is called Spiral kneading: meaning here that you basically knead the clay like you're kneading dough. To help get even more air bubbles out of your clay you can twist it into a spiral with the palm of your hand. Once you’ve prepared your clay you can then place metal plates that attaches to the wheel. This is known as “batting”. While this comes in all different shapes and sizes the size of the metal plates you put on the wheel will actually depend on what you’re trying to make. Ex: you wouldn’t use the same “bat” as if you’re trying to make a bowl as you would a cup. As a reminder just know that if the clay isn’t in the center, you might lose control of whatever piece you’re trying to create. There are many reasons why young children are actually encouraged to play with clay. This is despite the fact that clay soil can be yucky and icky and can be filled with a lot of germs. In order for our children to really reap the benefits of playing with clay, it is imperative that we provide them only with safer clay alternatives like play dough or even synthetic clay. But exactly why should young kids play with clay? Here’s why. Helps in problem-solving – Give kids a lump of clay and the first thing they will do is to look at it before they try manipulating it to form a particular object. This is the process of problem-solving at its most basic. Their young brains are trying to figure out what form will come out from this lump of clay. Enhances sensory development – As kids knead and shape the lump of terracotta, they are treated to a variety of textures which can be rough or smooth or even hard or soft. This helps enhance the development of their sensory integration and processing. Fosters creativity – Like problem-solving, creating something out of a lump of clay shows creativity. If kids can make a human figure out of their lump of clay and even without following a model, it simply shows their brain’s capacity for creative thinking. Simply therapeutic – Kids experience stress, too. They can get tense, feel anxious, and even feel frustrated. Giving them clay effectively dissipates the negative energy of stress into the clay providing a more relaxed and calming effect. 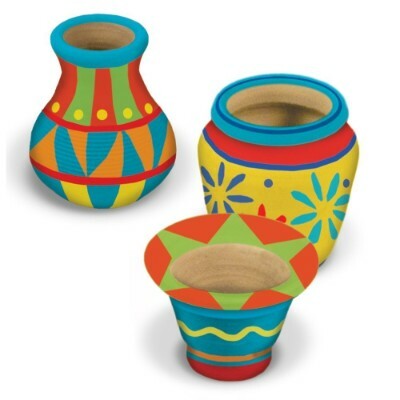 While we know that the items, we have listed above are specifically meant for children we wanted to make sure that each wheel was realistic enough so that your child will be able to create pottery. Pottery making is such a wonderful way for your children to develop their motor skills and enhance their creativity. We also know that having your child get involved with their hands is one way to get your child inspired and to create their own items that they’ll be proud of. We also know that when it comes to clay this will help give your children a sense of balance and gain them a little independence. In the end we know your child will be impressed with the results of their finished product that they can keep around the house or even gift it to someone they love.We looked at everything our list involving reviews, highest rated and ease of use. 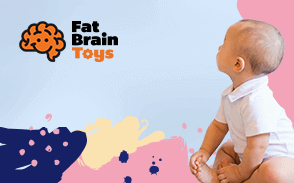 We made sure each product on our list was specifically for children and that the manufacturers on our list were held to the highest of customer overall satisfaction. Choosing the really amazing child’s pottery wheel can be quite challenging especially for folks like us who clearly don’t know what an earthenware wheel is and what it’s for. As such, even before we embarked on this mission, we had to seek the guidance of a master craftsman, someone who has been skilled in the art of molding clay products like pots and mugs that have been spun on some form of wheel. This gave us an idea of the unique qualities of earthenware wheels we have to look for. q: How can these products be used as a tool for family bonding? Often, parents want to share their own interests with their children! So it can be easy enough to see that if you have a passion for pottery, you may want to introduce a product like this. You may already have the grown-up version of these tools at home and your child would naturally want to mirror the experience! It could also become a vice/versa situation where the child’s interest might spark your own. Or, you simply want to be a supportive parent! In any of these cases, it involves taking an interest in your child’s activities, whatever that may look like. This can come in the form of actual participation, helping out, or just an encouraging word! q: Why are most of these kits only battery-operated and not compatible with a AC adapter? An AC adapter would require a more complex machine than what we offer! There are two very practical reasons for this: 1. An AC adapter wheel will be more expensive and we don’t know that you want to make that kind of investment; and 2. We aren’t sure if this a toy that your child will enjoy and want to keep for years. Buying a more complex machine involves a commitment, which, while it may ok for you, your child might not understand. We’re simply thinking about you as a parent and what will be most cost-effective. q: How does this aid in a child socialization process? In one of the previous questions I addressed how children like to mirror their parents. In another instance, there is the fact these wheels can be used as an educational tool in classrooms or therapy sessions. Often in large groups of other kids, under supervision, they can talk to each other about their common goals and projects in this creation. Also, teachers and therapists can bring out and foster deeper emotional connections that this form of play might be related to. q: A lot of these sculpting tools look quite flimsy, are they easily replaceable? Yes, they can be--with a little improvisation! As a parent, you don’t have to simply rely on the product page and manufacturer itself to get all of your needs met! Often, if one thing goes wrong with a product’s accessories, parents feel compelled to return the entire thing! Not so, if your child still has an interest, and the integrity of the wheel is still good, simply pop down to the arts and crafts store, or an art supply place, buy some replacement tools. I’m sure they have some durable wooden versions. Or, if worse comes to worse, you can always use some of that old plastic silverware in the cabinet you refuse to throw away! q: I noticed that a lot of these tend to stall, why is that? In some cases, the motor is not very strong and can’t handle a significant amount of pressure. In other cases, it a safety mechanism to prevent the motor from burning out. In the end, you have to realize that the pottery wheel is a tool, and in some ways like a motor vehicle! You have to treat it with some care in order to get continual use out of it. The purpose is to show just the right amount of pressure--give and take--that is required to create art! This balance is the reward that brings fulfillment to your child! q: Will these wheels stand up for more professional grades of clay that require firing? That’s a really good question! It’s hard to say! First off, I would say try it and see what happens! If that’s a little too adventurous for you, contact the manufacturer and ask about this. Since most of these items are toys, the motor tends not to be strong enough to handle heavy clay. But, it is a good idea to use this clay to show your child what the process is like when you become a “real potter!” This is especially the case, since the size of these wheels is so conducive to their small hands. One other issue you might have is using some of the light plastic sculpting tools on heavy clay--they might not cut it, so to speak!